with excursions and time to soak up Zanzibar’s paradise beaches. All your food will be lovingly made with seasonal fruit and vegetables fresh from the local markets. Bring peace and harmony back into your life by joining us for an experience of a lifetime. 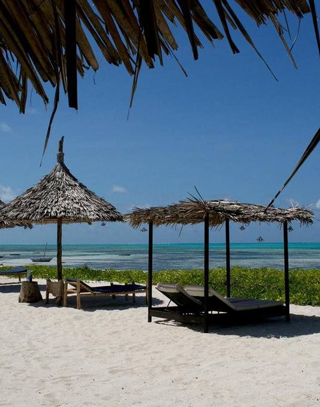 offers both beach and village life in a beautiful, exotic and relaxed atmosphere. the sound of the Ocean as you fall asleep. Bungalows are shared with two or three people. The village itself is laid back and has all the traits of the traditional African lifestyle. Every morning as the sun rises over the Indian Ocean, Paul will guide you through the first practice of the day, and at sunset. An energising and revitalising combination of Hatha Yoga postures to awaken your body and breath. This retreat is a precious time to connect, both inside yourself and with your Zanzibar community. Ayda’s personal yoga journey began as an effort to overcome health issues and stress — and her life is completely changed since then. As a curious soul, Ayda is constantly striving to expand her knowledge of different styles and teachings of yoga. Her favorites are Ashtanga Yoga and Power Yoga and in both she has a certificate. Having experienced yoga’s incredible healing benefits herself, Ayda wants to share the power of the practice with others. 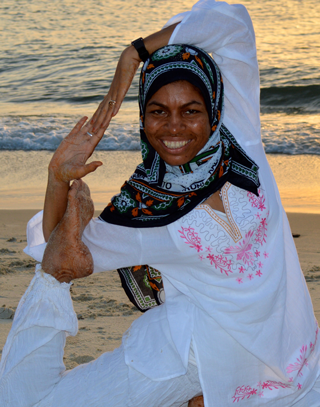 Since her first yoga encounter Ayda Abdallah has studied and practiced yoga for a decade. Ayda´s enthusiasm and passion is manifested in various projects. She is one of the founders of the NGO Yoga pura vida aiming at training teachers in Tanzania and Zanzibar to spread yoga in Africa. She is also the manager for the women project Sasik helping them to provide a better life for their families. Sasik´s creative patchwork design Arabic patterns are now decorating homes and hotels in Africa and around the world. Our food is a fusion of African and Indian flavours. Delicious vegetarian dishes will be prepared with the seasonal ingredients and spices of Zanzibar using Indian Ayurvedic principles. Fish can be added for anyone who would like it. Dinner will be all together around a large table overlooking the Ocean, where we can share food, stories and be our own community.